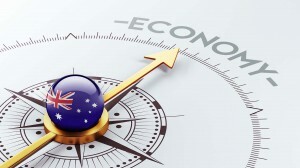 Economic activity across most of Australia continued to trend higher over the year to February, according to the ANZ Stateometer. While economic growth overall continued to remain below trend, several states contributed to stronger momentum. Solid labour market conditions and a re-acceleration in the housing sector have supported growth in New South Wales and Victoria. While Queensland’s index failed to hold onto the previous month’s gain, momentum in the mining states of Western Australia and Northern Territory continued to improve. The recovery in commodity prices has provided some support to the mining economies, and there are growing signs that the boost to incomes from trade is feeding through into other sectors. 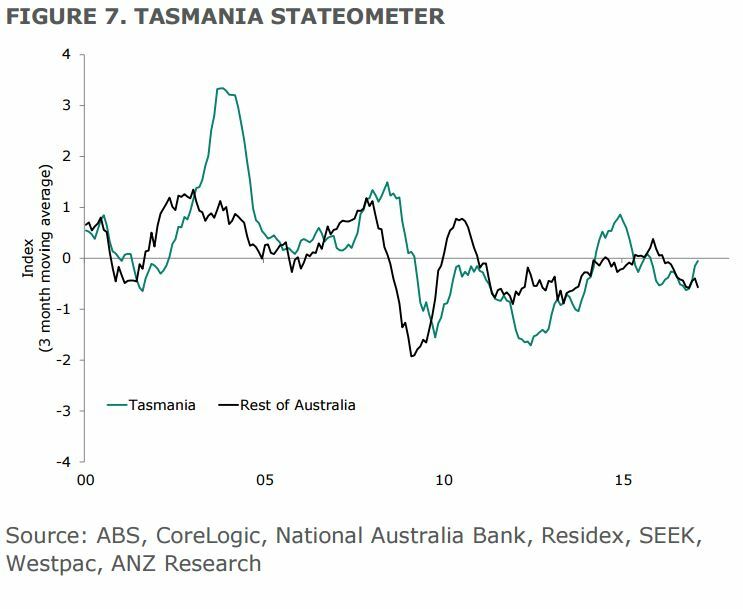 Improving labour market conditions and elevated business optimism have provided more positive momentum for both South Australia and Tasmania. The index for the Australian Capital Territory remained above trend, but decelerated as job growth moderated. 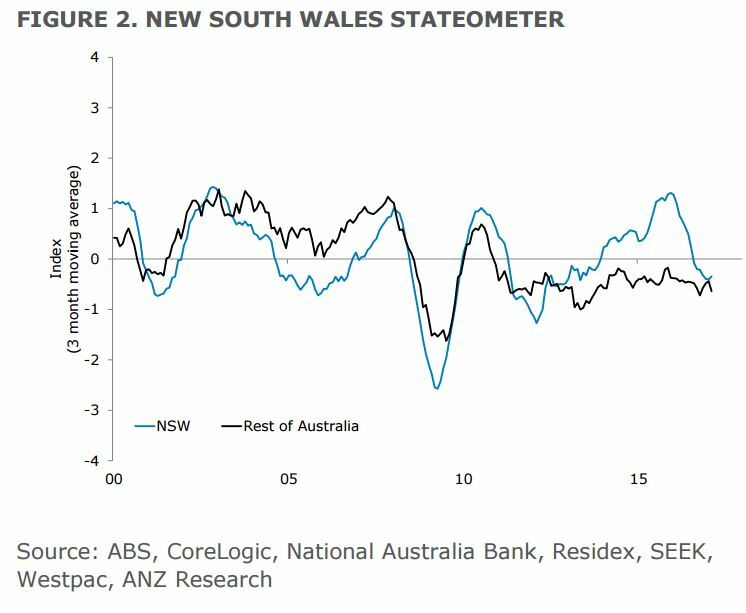 After 14 months of uninterrupted declines, the smoothed New South Wales index ticked higher in February. The primary driver of the gain was improved momentum in the housing sector with very strong growth in house prices and finance commitments. 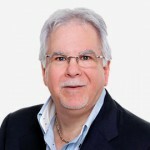 The recent pick-up in business conditions also contributed to the lift in the index. The other sectors (household, labour and trade) were broadly unchanged. 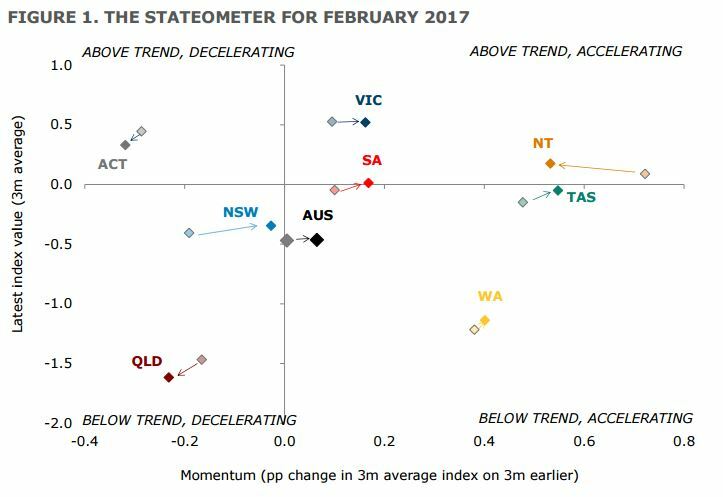 Underlying data suggest that momentum in the state’s economy stabilised in March. 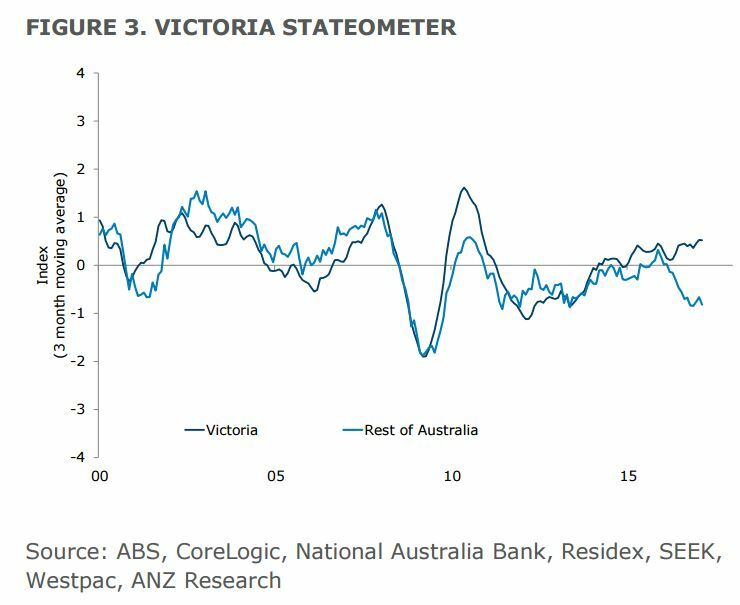 The Victorian index suggested the state’s economy continued to remain buoyant, with the index broadly unchanged in February at an above-trend pace. The ongoing strength in the labour market, together with rising housing prices and a pick-up in housing finance commitments provided a clear boost to the state’s economy. The household sector had lost some momentum more recently, amid a moderation in consumers’ confidence and weaker spending. The other sectors (business and trade) were little changed at close-to-trend levels. 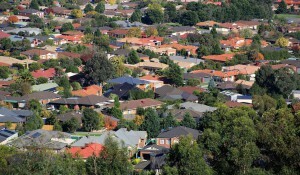 The underlying data suggest the Victorian index will likely remain little changed in March. 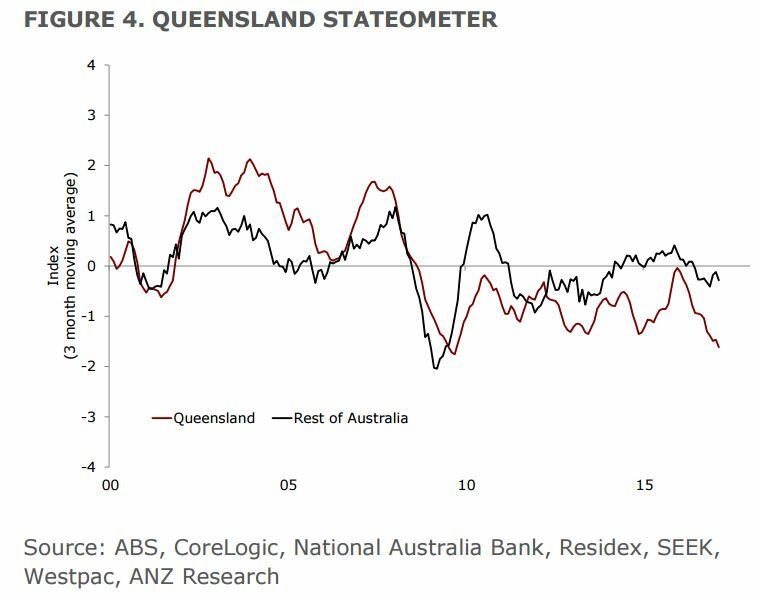 The smoothed Queensland index failed to hold into its previous month’s gain and ticked down in February – to its lowest level since September 2009. The boost to growth provided by the turnaround in trade was offset by a combination of deteriorating labour market conditions and weakness in the housing sector. Consumer spending also remained broadly subdued. Going forward, the upswing in trade should continue to add to growth, but we need to see a broader pick-up across sectors for there to be more positive momentum. 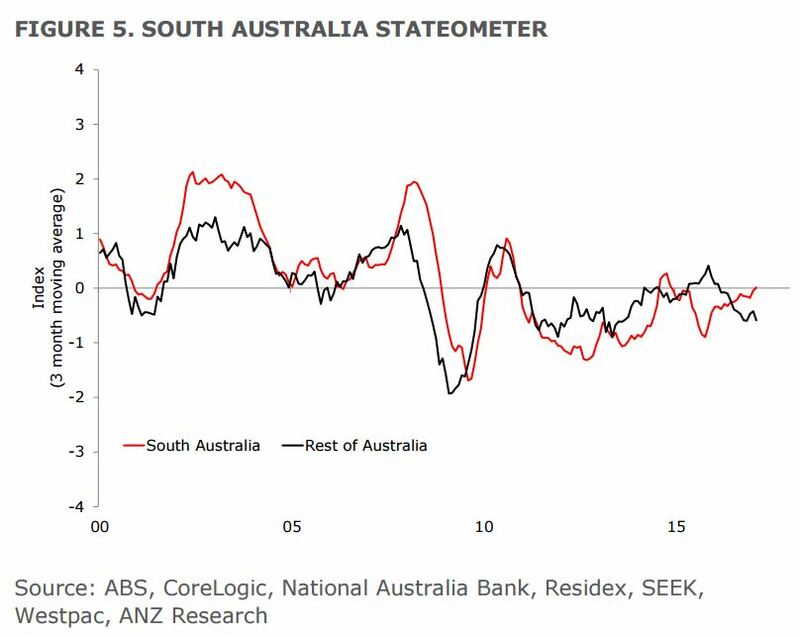 The smoothed South Australian index ticked higher in February, with the economy travelling at its long-run average pace. 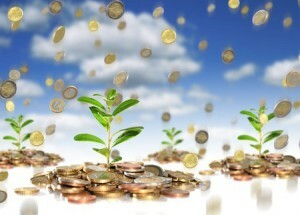 Business conditions improved sharply over the four months to February and provided a positive contribution to growth. Meanwhile, momentum in the labour market remained buoyant and conditions also improved across the housing and the trade sectors. Partially offsetting this strength, there was a deceleration in the consumer sector, largely driven by some slowing in discretionary spending. The underlying data suggest that the index may edge lower in March. 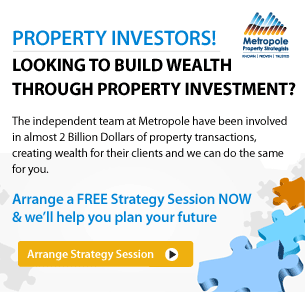 The index for Western Australia edged higher in February, up for the fourth consecutive month. The improvement in the state’s index was broadly based, with the tightening in labour market conditions being the prime driver of the turnaround. Rising exports and a sharp lift in business sentiment also contributed. The other sectors (household, housing) were little changed. 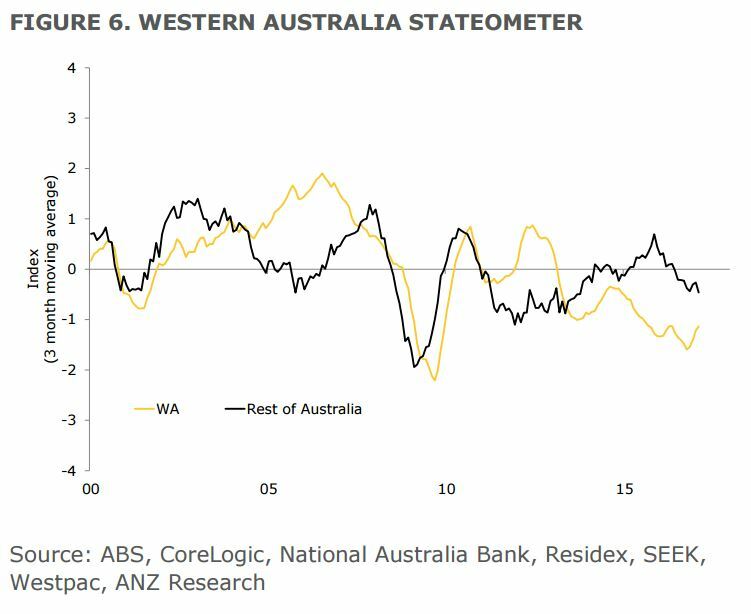 The underlying data suggest that growth in WA has likely bottomed and may have ticked further higher in March, although any improvement will likely have been moderate. 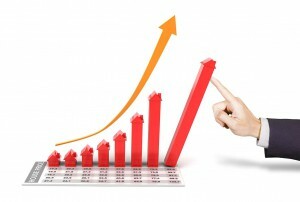 The smoothed Tasmanian index edged higher in February, close to trend growth. Conditions in the labour market remained solid, the trade sector continued to add to growth; and business conditions remained elevated. The other sectors (household and housing) were little changed. The underlying data suggest the index likely declined somewhat in March, but remained close to its trend rate. 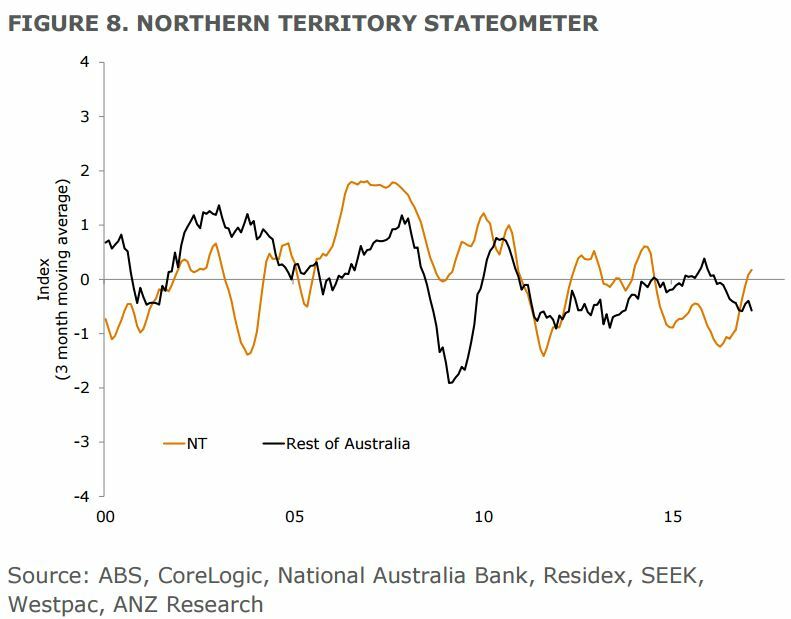 The Territory’s smoothed index has been rising since April 2016 and in February sat slightly above zero, signalling that the state’s economy was expanding at close to the trend growth rate. The improvement in the index was broadly based, with a sharp acceleration in both the labour market and the housing sector leading the gains. Encouragingly, momentum in the household sector also seemed to have improved somewhat with signs of a pick-up in consumer spending. The recent lift in commodity prices also supported growth. The underlying data suggest the index may have edged further higher in March, but remained close to trend growth. 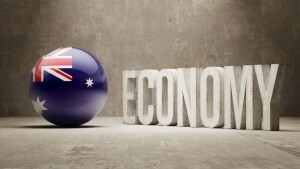 Economic momentum in the Australian Capital Territory slowed in February, down for the sixth consecutive month, but remained well above its trend rate. The loss of momentum over recent months was driven by a weakening in labour market conditions. However, momentum in the housing sector remained positive, and there are also signs of strengthening in the household sector. 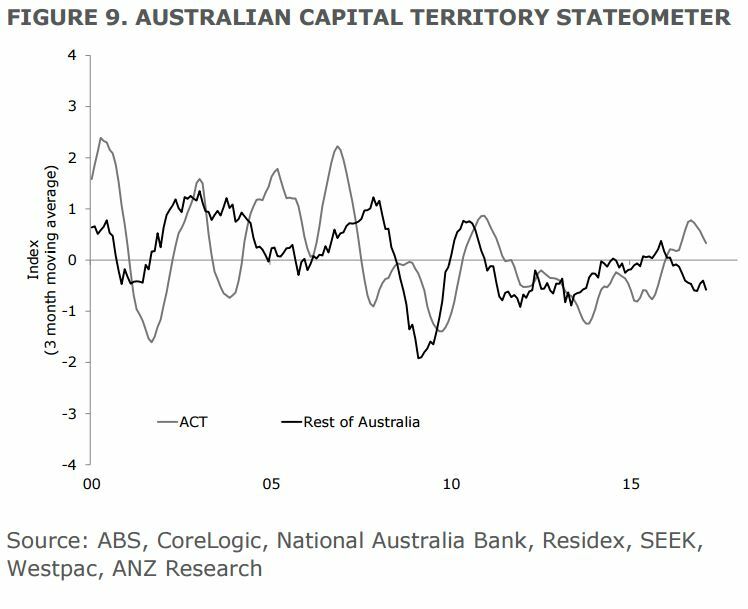 After the very strong readings in 2016, the Australian Capital Territory’s index is likely to moderate gradually towards its long-run average. 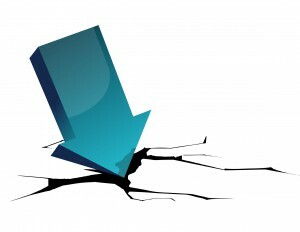 The underlying data suggest the index slipped further in March.